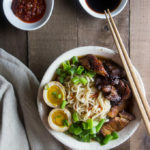 This crispy Instant Pot caramelized pork ramen is the ultimate comfort food, with tender pieces of melt-in-your-mouth pork, an ultra rich and flavorful broth, noodles and that oh-so-loved ramen egg. Heat 1 tbsp. bacon grease (or any cooking oil) in the Instant Pot over medium-high heat and sear the pork 6 minutes per side. Add the chicken broth, water, sake and dashi powder. Use the pressure cooker setting (high) to cook for 40 minutes. Use the quick release to release the pressure. Remove the pork from the broth and break into pieces on a baking sheet. OPTIONAL: Place all fat from pork back in the Instant Pot and use the pressure cooker setting (high) to cook for another 30 minutes. Use the quick release to release the pressure. Remove any remaining fat pieces. Sprinkle the brown sugar and dark soy sauce on the pork pieces, mix well and broil until pork is caramelized (5-10 minutes), being careful not to let the sugar burn. Add the fish sauce, soy sauce, black pepper, chili garlic paste, and rice wine vinegar to the broth. Set the Instant Pot to the saute setting and bring to a simmer for 5 minutes. While the broth simmers, cook the dried ramen noodles in boiling water for 3 minutes. Drain. Place the noodles in bowl and cover with broth. Add braised pork belly, caramelized pork pieces, green onions, 1-2 ramen eggs (halved) and garnishes, if desired. Sear the pork for 6 minutes per side. Place pork in slow cooker with chicken broth, water, sake and dashi powder. Cook on high heat for 4 hours. Remove pork from slow cooker and break into pieces on a baking sheet. Add the fish sauce, soy sauce, black pepper, chili garlic paste, and rice wine vinegar to the slow cooker. Cook the dried ramen noodles in boiling water for 3 minutes. Drain.